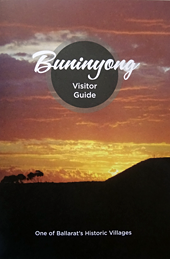 When you are in Buninyong call in to the Visitor Information Centre to pick up a copy of the excellent Buninyong Visitor Guide, revised in 2016 by the Buninyong Community Association, and chat with a friendly local volunteer about what to see and do in and around Buninyong. Before you get here, we recommend exploring this site or contacting the Visitor Information Centre by phone or email. Accommodation Looking for somewhere to stay? Buninyong has some delightful B&Bs. Food and Wine Try out our local cafés: yummy food and great coffee! Places to visit There are many interesting things to see and do when you are here: see what the locals suggest. Services & Amenities Where is an ATM, the doctor, footy ground, swimming pool, etc? See the directory of services and amenities in Buninyong. 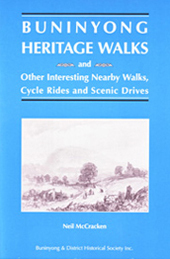 Buninyong Heritage Walks booklet, is an excellent booklet of walks around Buninyong. With maps and background information, it is on sale for $5.00 in the Buninyong Visitor Information Centre. Interested in a group tour of Buninyong? The Buninyong Information centre has organised several very popular tours of the township and surrounding district. This site aims to cover all aspects of public life in Buninyong and the surrounding district, for visitors and local residents alike. It covers neighbouring Mt Helen and nearby hamlets such as Scotsburn, Clarendon, Lal Lal, Yendon, Navigators, Magpie, Napoleons, Scotchmans Lead, Durham Lead and Garibaldi. If you can't find what you are looking for on these pages, clicking a link to one of the local community groups, businesses or services with specialised knowledge should bring the answer. Alternatively, you can email us at the bunlibtrust@gmail.comand we will do our best to follow up your query (apart from family history enquiries which should be sent to the Buninyong and District Historical Society). Please direct all online family history enquiries to the: Buninyong and District Historical Society. The society publishes an excellent bi-monthly newsletter which includes local geneaological information and readers' queries. Many family history resources are also stored in the Buninyong Information Centre. It is open 6 days a week, Tues - Sun, 10am-3pm, and local volunteers are on hand to assist you with your enquiries. This website does not undertake geneaological searches.